Imagine the ultimate sanctuary, located in a premier leisure and lifestyle community. With Surf Life Saving Lotteries Prize Home draw 188, you can have the chance to win a prestigious contemporary home and prize package worth over $1.2 million! The home features 4 bedrooms, 2.5 bathrooms and a stunning modern split-level open-plan design. The home boasts all the amenities and features you need for complete relaxation. Situated in the stylish Sanctuary Cove area next to the Pines Golf Course and Marina on the Gold Coast, making it the perfect home for golfers, boating fans, or those simply looking for style and luxury. The spacious master suite features a walk-in wardrobe and ensuite, while the bedroom opens onto a large balcony with views of the residential community. The home comes complete with a $142,000 design and furniture package to showcase your sanctuary at it’s finest. Step outside the elegant open-plan kitchen, dining and living area to the alfresco outdoor entertaining area. The backyard space is such a diverse area, meaning the possibilities for fun and relaxation are endless. Have a BBQ with the family, before cricket and a swim. Or warm the spirits with a few friends and a fire. 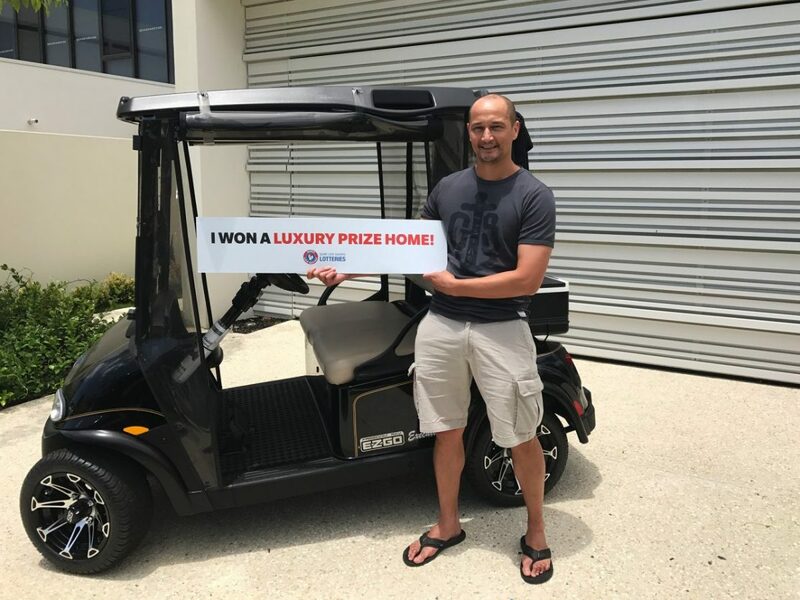 As if the stunning home wasn’t enough, first prize includes your very own Golf Buggy – valued at $13,509. Cruise the neighbourhood and golf course in style! First prize also comes with a bonus $1,000 Golf World gift voucher and an incredible $20,000 Gold Bullion. What would you buy? Everyone dreams of that one phone call that can change your life. For one lucky winner, it was the call to say he had won the Surf Life Saving Lotteries Lotteries draw 183 and his dream home in Sanctuary Cove on the Gold Coast. Mr I. from NSW won a luxury prize home in Sanctuary Cove on the Gold Coast. PLUS $50,000 in Gold Bullion, making the total first prize value to $1,220,990!